And than 1 it’s slightly more. This process within our brains is a three-step loop. A trigger that tells your brain to go into automatic mode and which habit to use. Which can be either physical, mental, or emotional. Which helps your brain figure out if this particular loop is worth remembering for the future. Over time, this loop-cue, routine, reward – becomes more and more automatic. The cue and reward become intertwined until a powerful sense of anticipation and craving emerges. Eventually a habit is born. From the moment the first stewardesses took flight in 1930, flight attendants became glamorous icons of femininity. For decades, airlines hired only young, attractive, unmarried white women. They marketed passenger service aloft as an essentially feminine exercise in exuding charm, looking fabulous, and providing comfort. The actual work that flight attendants did—ensuring passenger safety, assuaging fears, serving food and drinks, all while conforming to airlines’ strict rules about appearance—was supposed to appear effortless; the better that stewardesses performed by airline standards, the more hidden were their skills and labor. Continue reading Coffee, Tea or Me? Structurally, the aliens are more like jellyfish than mammals. By examining DNA molecules, it appears that the aliens possess humans by using a cell phase matching technique. The aliens cells literally overtake the human cells through osmosis. As a result, they have access to the host body’s intelligence, and can control them physically. And yet there is no outward way for anyone to know. Physiologically, the aliens have a liquid core which carries neurological information as well as arterial matter. Their stable, upright carriage is supported by a weblike musculature structure. The aliens stand between 5 1/2 and 7 feet tall. It has a cyclops eye in the center of its forehead and it is a biped. It has three fingers, three toes, and three arms. Apparently, it has no skeletal structure per se. … Maybe a theory that prehistoric people were able to count only “one, two, many”. … the “three” in one context means “typical, average”. … It happens three times, there is a pattern. Through explorations of the three pillars of Zen–teaching, practice, and enlightenment–Roshi Philip Kapleau presents a comprehensive overview of the history and discipline of Zen Buddhism. 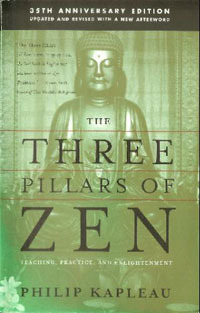 An established classic, this 35th anniversary edition features new illustrations and photographs, as well as a new afterword by Sensei Bodhin Kjolhede, who has succeeded Philip Kapleau as spiritual director of the Rochester Zen Center, one of the oldest and most influential Zen centers in the United States. Wondering if things will work out with your new beau? Here, three characteristics to consider when you begin dating someone, from “Become Your Own Matchmaker” by Patti Stanger, star of Bravo TV’s “The Millionaire Matchmaker”. Become Your Own Matchmaker: 8 Easy Steps for Attracting Your Perfect Mate.